All 11 Max locations to increase awareness and raise money for Autism Speaks New England. 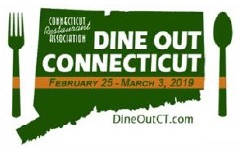 HARTFORD, CT – Compassion needs no words when you dine at a MAX restaurant for its fourth annual “Dine for a Cause” event. 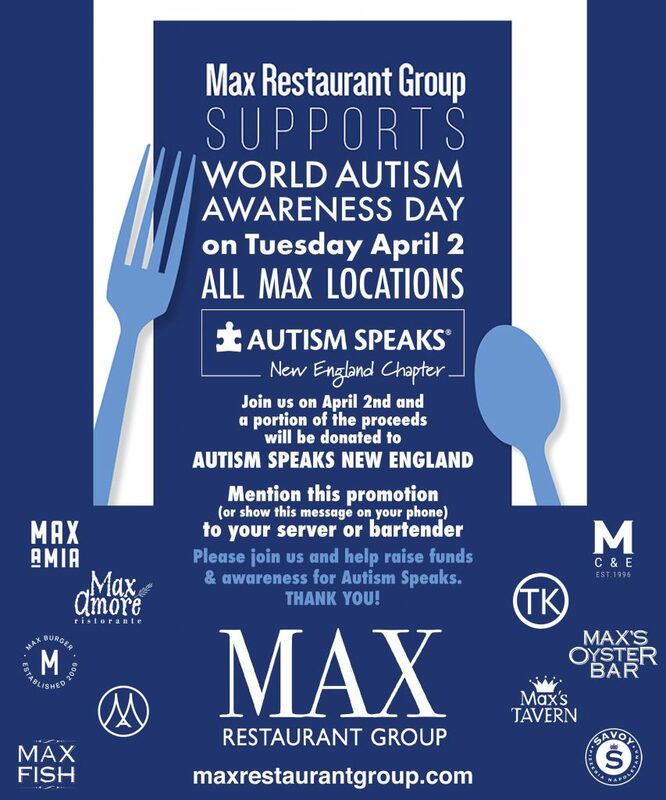 On Tuesday, April 2, dine at any of the 10 Max restaurants in Connecticut or Massachusetts in support of World Autism Awareness Day and to help those in our community who have Autism Spectrum Disorder. During the one-day fundraiser, a portion of your bill will be donated to Autism Speaks New England. Guests are asked to mention the fundraiser to their server or bartender for proceeds to go to the charity. Additional donations will be accepted through Sunday, April 7. 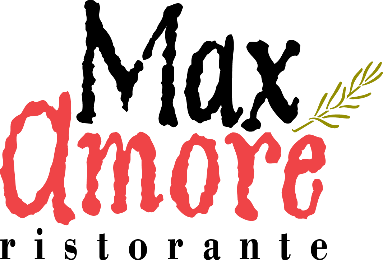 Greater Hartford International Pinot Noir Festival – Final List of Wines to be Shown is Tremendous! We are just a day away from this inaugural tasting event, which looks to be a classic for anyone who is a fan of wine, and especially Pinot Noir. With a tremendous selection of Pinot Noir from around the world, we will be show-casing wines at many price levels and regions. Just take a look at the list below – cannot express how much fun and what an opportunity this event will be. Beautiful weather and a great setting at the atrium at Max Downtown in Hartford. Tickets are available (we have lots of space) and of course plenty of wine. Single ticket price to the tasting is $45, plus tax and gratuity, and there will be passed snacks and light fare. At the door tickets will be $55 plus tax and gratuity, if you are still thinking about going, later. Since 1956, Michele Chiarlo has been vinifying the essence of Piedmont, loving and developing the most incredible wine region in the world. 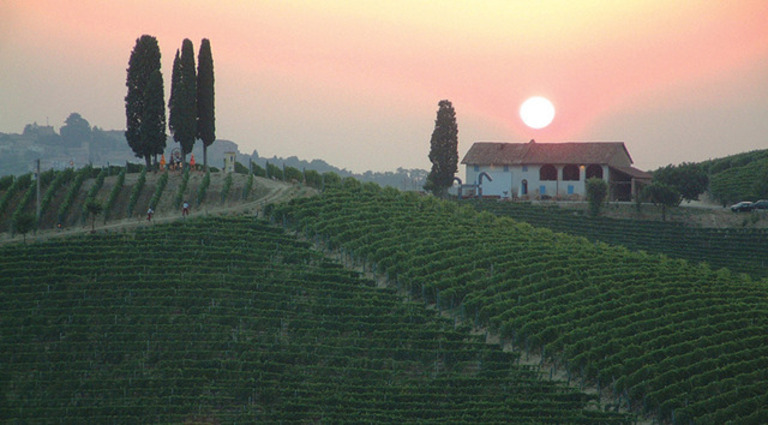 There are 110 hectares of vineyards between Langhe, Monferrato and Gavi. These crus respect both ecological criteria & the expression of the terroir. Michele Chiarlo has not abandoned his philosophy. Rigorous selection of the best grapes from only the most reputable growers in the most favored vineyard areas and longer aging in oak and then in bottle prior to release were measures he adopted before the DOC laws. Additionally, from the beginning, Michele Chiarlo has directly managed or personally overseen every aspect in the productions of his wines. Since the early 1990s, his sons, Alberto and Stefano, have also held management roles. Alberto, the elder, directs Marketing and sales; Stefano, an oenologist by profession, manages vineyard operations and collaborates in production in the cellars. We are very pleased to present these wines at Max Amore as part of our continued wine dinner series featuring some of the world’s great estates. 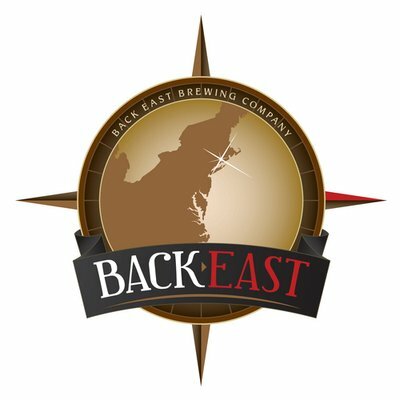 Back East Brewing Company is a Craft brewery located in Bloomfield, CT. Founded by Tony Karlowicz and Edward Fabrycki, Jr., two cousins with a passion for great-tasting, high-quality beer, Back East opened their doors in July 2012 and is now distributed throughout Connecticut and Western Massachusetts. Although originally from Connecticut, Edward began to home-brew while living in San Diego during the 1990s. He eventually moved “Back East” to Connecticut in 2001, with the dream of someday opening a Craft brewery. As a Professional Engineer, Edward enjoys the technical aspects of brewing. Tony developed his appreciation for Craft beer during his college years in Vermont, and always imagined launching a brewery. An entrepreneur at heart and a CPA with extensive experience in accounting, auditing, and insurance, Tony loves building a successful business from the ground up. Tony and Edward began homebrewing and experimenting with different recipes in early 2006, and immersed themselves in all things Craft beer. Over this time, they developed several exciting recipes that they are proud to put the Back East name on. We are very pleased to welcome these great local brewers to Max Burger in Longmeadow as part of our continued partnership with outstanding local craft brewers. 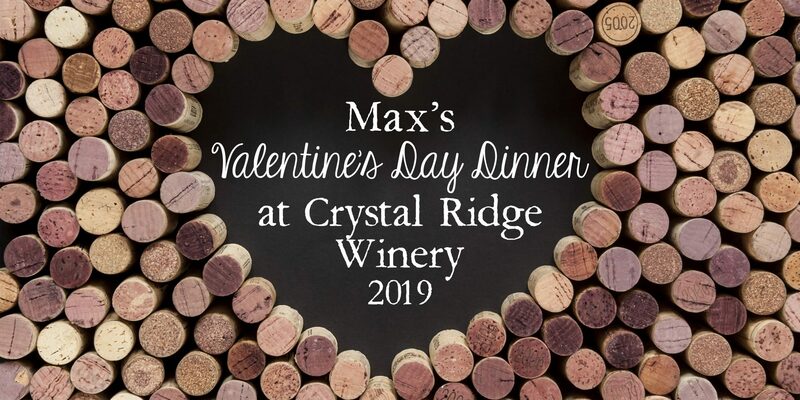 Max Restaurant Group is very pleased to partner with Crystal Ridge Winery in South Glastonbury, to present an exclusive Valentine’s Day Dinner in the winery. Located on 200 acres above South Glastonbury, with some of the best views in Connecticut and surrounded by vineyards and orchards, this is a romantic and intimate setting. Enjoy a reception in the winery loft overlooking the CT River Valley, then enjoy a reception followed by four course meal paired with wines from Crystal Ridge as well as other world class selections. Finish the evening with a decadant dessert and wine pairing. CABS & SLABS is Back! Founder, Jim Bernau, purchased the Estate site in 1983 and cleared away the old pioneer plum orchard hidden in Scotch broom and blackberry vines. He planted Pinot Noir (Pommard and Wadenswil clones), Chardonnay (Dijon and Espiguette) and Pinot Gris. In the beginning he hand-watered the vines with seventeen lengths of 75′ garden hose. 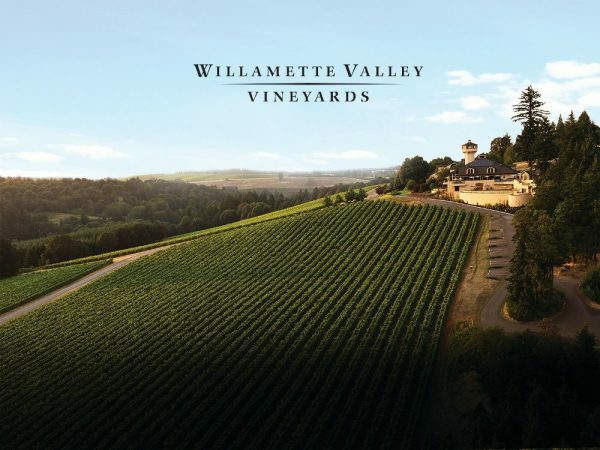 Willamette Valley Vineyards has come a long way since then. Today, the stylistic emphasis is on pure varietal fruit characters, with attention to depth, richness of mouthfeel, and balance. The wines are truly a collaborative effort of the entire vineyard and winemaking staff. Join us at Trumbull Kitchen to meet one of those winemakers and a fabulous dinner, pairing Willamette Valley Vineyards wines with Chef Chris Torla’s menu. 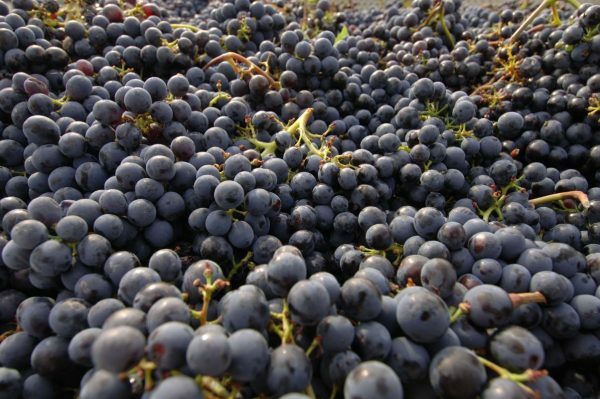 The Rhone and Southern France have had the good luck of a number of very good vintages, as of late, and no other family really exemplifies the region as well as the Perrin family of Chateauneuf du Pape. With multiple generations behind, ahead and currently in charge of some of the top vineyard locations across the region, the Perrins continue to deliver some of the most exciting wines of the entire region – and with some of the best values anywhere. Join us as we explore some of their newest creations and more traditional offerings, for the inaugural date for the 2019 Lunch Club Season. Cuisine prepared by Chef Bob Peterson. 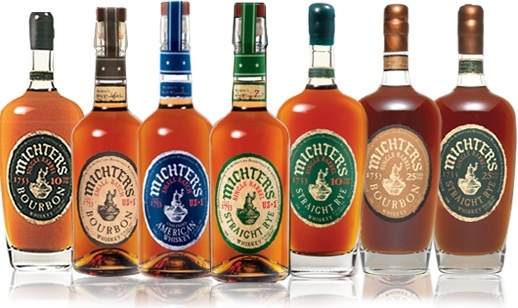 The US*1 expressions, so named to honor Michter’s heritage harkening back to America’s first whiskey company, founded in 1753, consist of some of the finest single barrel and truly small batch whiskeys available. We are very pleased to present these wonderful and extremely limited whiskies in cocktails and straight alongside Chef Peterson’s menu. Chef Peterson is currently working on the menu, it will be posted as soon as he completes. 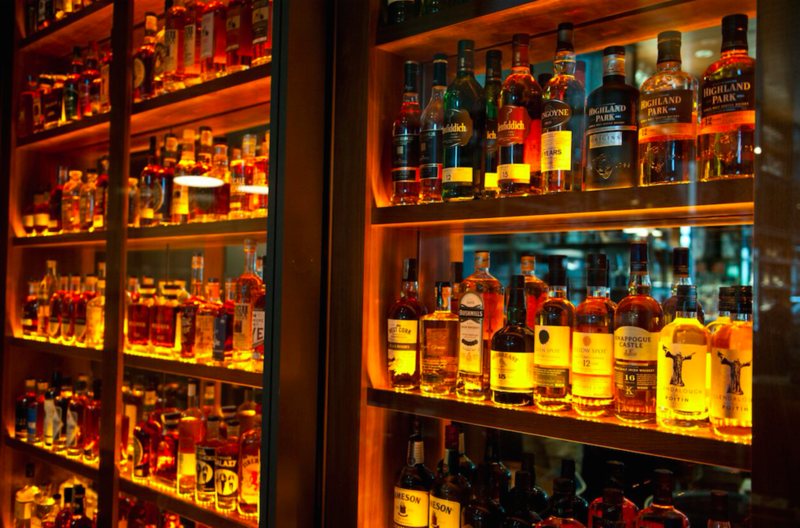 But here is the basic lay-out and the flow of whiskeys that will be presented to give an idea of what we are talking about. Cocktails created by Bar Manager Derek Vitale. I am very pleased to announce the dates for our upcoming season of Max Lunch Club events at Max’s Oyster Bar, in West Hartford Center. For years, we have been presenting great offerings of wine and food combinations in essentially what is a trimmed down wine dinner, but delivered at lunch (and always on a Friday). I try and make sure that we are visited by winery and industry processionals that have an interesting perspective on the topic at hand, and can give our Lunch Club guests some great insight to the wines we are featuring. All of this paired with Chef Bob Peterson’s creations make for a great way to enjoy an afternoon, and a civilized luncheon. Additionally, I take a lot of professional pleasure and pride in making these selections and pouring the wines that I have hand-selected for each event. Bringing the various guest speakers to our market and introducing them to the Lunch Club members is such a great way to work with wine that I have discovered and enjoy – I hope you agree. Here is the list of dates that will be filled for the 2019 season, and while all topics have not been filled in quite yet – I am working to get these topics filled shortly, and will be updating as I gets commitments. As always we ask our guest to arrive at 12:45, and generally plan to start the event at 1pm. We will also be continuing our partnership with the Wise Old Dog wine shop in West Hartford on all of these events. Please feel free to reach out to me if you have any questions or comments. For this date we venture to the Rhone Valley and taste selections from the Perrin family, owners of Chateau de Beaucastel, perhaps considered to be the premier Chateauneuf-du-Pape estate. The Perrins have been a long-standing favorite of mine, and they continue to develop new wines and regions to show the diversity of the wine regions of southern France. 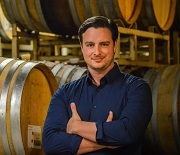 Paul Nerz of Vineyard Brands, the import company responsible for the Perrin wines in the US, will be on hand to present. Wine Educator Thom Horsey of Ste Michelle Estates pays us a visit and will be presenting wines from the larger portfolio of this top producer. Stay tuned for the specif wines and menu. Prosecco is about the hottest wine category going over the past ten years, only surpassed perhaps by Rose (who would have thought?). The Bolla family has been making exceptional Sparkling wines north of Venice since the 1930s, and the current generation has been working hard to make it event better. 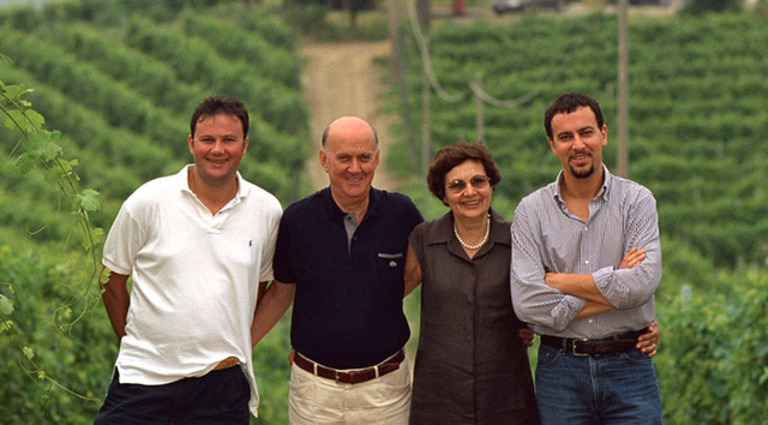 Matteo Bolla is an exceptional ambassador for the family winery and the region as a whole. 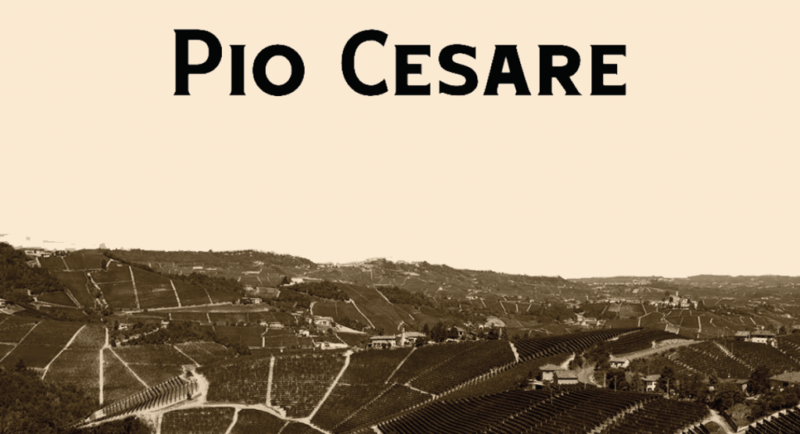 See why Prosecco is not just a note wine, but a diverse region with complex wines. This past year I had the pleasure to travel to the Loire and experience some phenomenal wines from regions that are familiar to some, but less well-known to others. For this lunch I will be presenting a selection of wines from top producers I met on my travels. This has become an annual favorite, and a lunch that I personally really enjoy. Each year I present a Beaujolais Nouveau from the current release, which is allowed to be released just the day before to the world. This is followed by a selection of top wines from smaller producers that have contributed to the absolute turn-around in everyone’s view of the Beaujolais region. The leader in authentic and pure wines, this is the new frontier of exceptional value and food-friendly wines from France. Chef usually pairs with some classic French dishes, making this all the better for foodies!